A removable retainer is a great option because you do not have to wear it all the time, which makes it easy to brush your teeth. Not to mention, they are more affordable than other options. Unfortunately, despite your best efforts to protect it, it is now broken. Whether your dog chewed it up or it snapped when you were removing it, it will need to be replaced. Do not continue to use it and do not try to fix it on your own. This could lead to an oral injury or a relapse of your orthodontic issues. Instead, it is best to call your dentist in Aurora right away. In the meantime, they may suggest you use an over-the-counter mouthguard to help prevent your teeth from shifting. 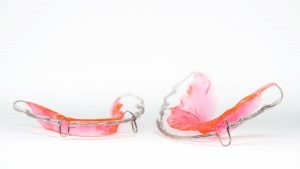 Many choose to have their retainers fixed in place because you cannot lose or forget to wear them. In some cases, they can even be less noticeable than a removable option. Although you may be a bit surprised if it breaks, it is actually quite common. Over time, the bond that holds it in place can weaken, causing it to come loose or fall out. It can also be damaged while eating. Since it is fixed in place, this makes it a little more difficult to treat. You may need a dental professional to remove it from your mouth to avoid causing an injury. To determine the extent of the problem, have a friend or loved one look in your mouth to see if it is stable. If the break is extensive, it is best to call your emergency dentist right away to have it removed. If it is a minor issue, it can often stay in place until the following day; however, it is best to avoid eating any hard foods. If any irritation occurs, rinse your mouth with warm salt water. If it has been several years since your braces came off, you may be tempted to just stop using your retainer if it breaks, but this is not the best option. Instead, call your dentist to see what your next course of action should be. After graduating from dental school with honors, Dr. Andrew Ricci began serving the community with high-quality dental care. He has continued his training in advanced studies to provide his patients with comprehensive services, including orthodontics. If you are having an issue with your retainer, do not wait. Contact our office right away.